Director Alex Cox has always flown under the radar, despite being responsible for memorable films like Repo Man and Sid and Nancy. His choice to tackle the controversy of the United States� involvement with Nicaragua in the 80s culminated in 1987�s Walker, a biopic in the weirdest sense of the term. U.S. audiences were not at all interested in the film at the time, and almost every American film critic hated it. Still, a couple hailed it as a visionary masterpiece, and the L.A. Sentinel even deemed it one of the ten best films of the year. The simple fact that it�s finally being released on DVD by The Criterion Collection should be enough to draw adventurous moviegoers. Colonel William Walker (Ed Harris) has given up his successful career as both a doctor and lawyer to try and conquer Mexican territory in present-day Southern California. Following that failure, he is commissioned by industrialist Cornelius Vanderbilt (Peter Boyle) to overthrow the government in Nicaragua and become their president. He chooses this assignment after losing his beloved (Marlee Matlin) to cholera, and travels to Nicaragua with his group of fighters, dubbed �The Immortals.� Walker�s quest soon becomes a power trip, and, with the body count piling up, he struggles to maintain the support of his men, while trying to maintain his sanity as well. A true gem of strange greatness, Walker is a rare discovery. I�ll admit to having never heard of the film until a few weeks ago, and I doubt I�m alone in such a distinction. What a discovery it is, as this is one of the most unique and engaging biopics of all time. Those of you looking for typical, linear biographical fare are in the wrong place, as Cox gives us a deluge of shocking, completely unexpected imagery around nearly every turn. There is absolutely nothing conventional about this film and for that reason alone, it is one of the easiest recommendations I�ve made in quite some time. Mind you, this is much more than simply a director throwing random craziness on the screen and hoping for the best (see Oliver Stone�s Natural Born Killers for an example of that), and for such a bizarre, yet focused vision, director Cox deserves to finally get the credit he failed to find upon the film�s initial release. The performances are top-shelf, with Ed Harris proving more than capable of carrying the film, and some amazing work from Benson�s Rene Auberjonois. However, it�s Joe Strummer�s amazing score takes the film to another level entirely. The late, great former member of The Clash eschews his punk rock tendencies to deliver one of the most original scores in movie history. It�s a downright crime that this isn�t heralded among pieces by John Williams and other legends in the field. Some critics even singled out Strummer�s work as one of the film�s problems. The battle scenes are nice and bloody, with syrupy gore effects spewing from the actors as they are shot. It�s clear that Cox is paying homage to The Wild Bunch (blink and you�ll miss a sign reading �Sam Peckinpah� on one of the battlefields), but he�s never overly obvious or heavy-handed in his intentions. Cox is constantly blurring the lines between reality and fantasy by placing many current pop culture devices (Time and Newsweek magazines among them) into the nineteenth century setting. We even get an appearance by a helicopter during the finale, but this is all a part of Cox�s attack on American Imperialism via the hilarious, poignant (especially during our current political landscape) satire that is Walker. Image Transfer Review: This 1.85:1 anamorphic widescreen presentation comes from a high-definition transfer approved by director Alex Cox. Images are extremely detailed and sharp, benefiting from a bright, vibrant color scheme that often bursts off the screen. Flaws are kept to a minimum, but there are still a couple of issues, which isn�t a major surprise given that the film is over 20 years old. Audio Transfer Review: The original mono audio is here, and it sounds very good, serving the material quite well. Joe Strummer�s score is the highlight here, and it�s also the centerpiece of the audio mix. The dialogue is well-integrated into the mix as well, and is never overcome by Strummer�s music. 1 Feature/Episode commentary by Director Alex Cox and screenwriter Rudy Wurlitzer. The Immortals � Collection of still photos. On Moviemaking and the Revolution � Audio monologue. Extras Review: The incredibly impressive (especially for a single-disc release) extras begin with an audio commentary by director Alex Cox and screenwriter Rudy Wurlitzer, during which the pair deliver a riveting discussion. This is a film that almost demands such a talk; it�s clear that these two are extremely passionate about their movie, and they have more than enough valid points to back up their accomplishments. Dispatches from Nicaragua is a 50-minute documentary culled together from 30 hours of behind-the-scenes footage that sat in a garage for 20 years. A ton of editing has resulted in this amazing piece by Terry Schwartz that is full of candid interviews and on-set footage, and finishes up with an unforgettable talk by a local villager that will have you reaching for the nearest box of tissues. When�s the last time you could say that about a DVD supplement? There�s also a series of still photos found under the title �The Immortals,� as well an 11-minute audio monologue called On Moviemaking and the Revolution. It�s too bad there isn�t any accompanying video with this, but it�s not every day we get to hear an extra discuss their memories of a film as they watch it 20 years later. The final feature is listed on the back of the DVD case, but is presented as an �Easter egg,� as it is hidden on the main menu. To access it, simply highlight �On Moviemaking and the Revolution� and push the down arrow button on the remote. This will highlight the �A� on the movie�s title, and pressing enter begins the six-minute piece that features Cox discussing Walker�s reviews and throwing the numerous negative ones in his fireplace. 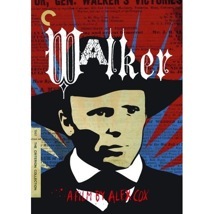 I�m almost ashamed I�d never heard of Walker before receiving The Criterion Collection�s new DVD, as it is an unforgettable, unconventional biopic. Film fans everywhere owe it to themselves to discover it as soon as possible. The audio and video are excellent, but you�ll be hard-pressed to find a better collection of extras on a single-disc release.